Restore Your Oral Health with Dental Implants in Waco! If you’re missing one or more of your teeth, then you’re left vulnerable to some serious problems happening that could have greater implications on your oral health. Thankfully, there is a way to prevent the pitfalls of prolonged tooth loss – with dental implants in Waco. 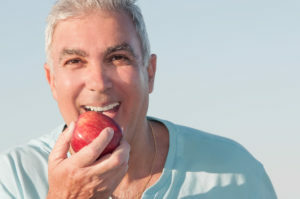 As you continue reading, your implant dentist explains why they are so beneficial. Super Eruption – Your teeth rely on both horizontal and vertical tension from those surrounding them to sustain their proper position. A super eruption occurs when there is no vertical pressure from a missing tooth above or below. As a result, the remaining tooth may protrude from the gums, which can cause problems with occlusion (your bite). Dental Tipping – When an adjacent tooth is missing, the remaining one can begin to lean in the direction of the open space in an attempt to re-establish normal tension. The shifting can leave the gums and teeth roots exposed, and vulnerable to infection. Bone Loss – A final danger of extended tooth loss is bone degeneration. This again is based on the fact that your teeth rely on shared tension to be healthy and stable. So when even one tooth is missing, a message is sent to the jawbone to stop or slow down the production of new bone cells. Dental implants in Waco serve as the best form of tooth replacement available. They consist of titanium posts that are attached to your jawbone to mimic your natural teeth roots. Over time, the posts fuse with the same to form a sturdy foundation. You can once again smile with confidence. Cared for properly, dental implants can last up to a lifetime. They allow you to eat a normal diet with the full function of your teeth. They prevent your other teeth from shifting and protect you from bone loss. To find out whether you qualify for the dental implant procedure, visit your implant dentist for a full examination and consultation. The specialist will make sure you have a sufficient amount of healthy bone and that you’re well enough to undergo anesthesia. This visit will also be an opportunity for you to learn more about the procedure and how it can accommodate your specific needs. So to get a new lease on your oral health and replace your missing teeth in Waco, reach out to schedule a visit today. At Heart of Texas Smiles, Dr. Nick Cobb and Dr. Teresa Lassetter provide patients with comprehensive and detail-oriented care, using state-of-the-art equipment. To have your missing teeth replaced and to regain a better quality of life with dental implants, you can contact the professionals through their website. Comments Off on Restore Your Oral Health with Dental Implants in Waco!